From the moment you walk through the door you will feel at home. This rustic yet spacious kiwi bach offers you a chance to be lake front at an affordable cost. Simplicity and comfort teamed with retro style. This two storey home has enough space to offer larger families or two smaller families the chance to holiday together. This fully fenced property is also suitable for younger families and ideal for those who need room to park the boat or store bikes, jet skis, kayaks or paddleboards. Drag the kayak out the front gate onto the reserve and enjoy a paddle in the picturesque Lake Rotorua. If fishing is your thing, there is excellent trout fishing off the bank of the reserve (fishing gear must be supplied by you). Only a 10 min drive from the central city, this is a quiet and peaceful location removed from the sulphurous smells of Rotorua, yet so close to all the shops, restaurants and activities. Professionally laundered hotel standard linen and towels are provided. Please note that this is an older home with original kitchen and bathrooms. All bedrooms are upstairs. 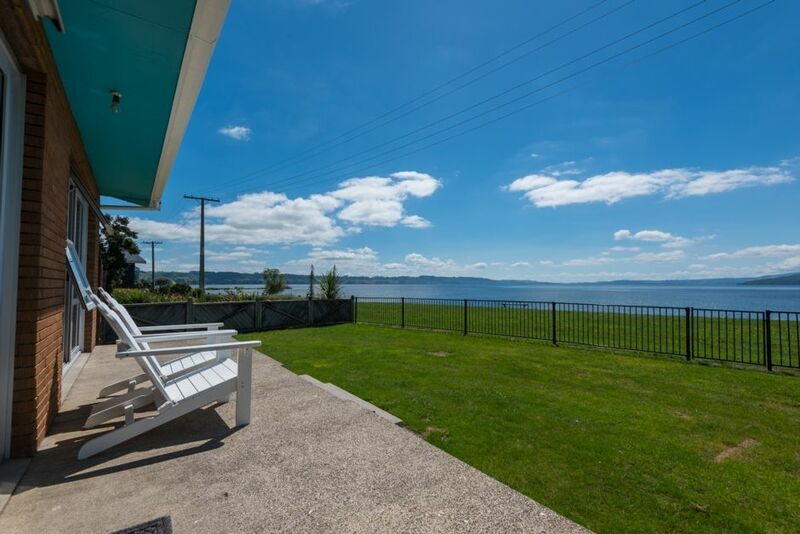 We manage and rent holiday homes in and around the Rotorua District. We've got one of the best 'backyards' in the country with the forest, our 18 lakes and numerous attractions within a short drive of the city. Take a look at our houses if you're looking for a great place to stay in the area. Room for boat parking and all the toys - enjoy the magic of the lake! The boat ramp is only 100m away. Beatiful home and excellent spot close to the lake. Home had everything we needed, was spacious and close to attractions, local shops etc. Great location and huge house. Kitchen could do with an update. Nice and clean - kids did freak out at the dead cockroach in the bathroom though! Absolutely stunning view right on the lakes edge, all fully fenced for little kids which is excellent. House itself is spacious and large. Reasonably clean and very tidy. It desperately needs substantial heating upstairs in winter, downstairs is warm due to heat pump in the lounge. Very quiet immediate neighbours and only a stones throw from central town and all the attractions.